Includes 1 covered egg holders hold up to 34 eggs with a clear lid for easy visibility,Mainly for families, restaurants, schools, hotels, hotels provide matching high-end . Please note: Eggs in the figure are not included. Edge Arc design, sleek, PP plastic certified at the bottom of the box and temperature standard -68 °F ~ 254 °F. Covered, stackable, with compartments. Can enlarge the big eggs, big duck eggs. 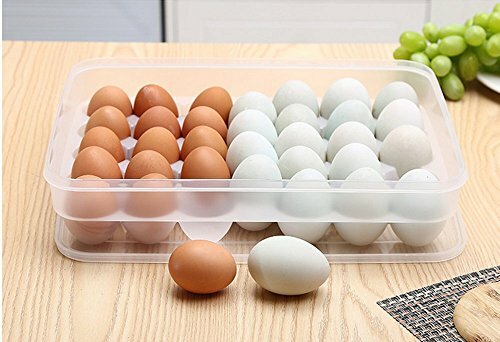 34 transparent egg boxes, large capacity, do not worry about being crushed, can be used in multiple stacks, placed in the refrigerator, neat and beautiful space-saving. DIMENSIONS: Egg holder measures 13.5" x 10" x 3".Please note: Eggs in the figure are not included. DURABLE: Made of durable, PP plastic. Hand wash with mild soap and water，Dishwasher safety.